In 2010, Army Staff Sergeant Frank Wasson III was on his second deployment and serving as an Infantryman squad leader with the 2nd Battalion, 327th Infantry Regiment, 101st Airborne Division, in Kunar Province, Afghanistan. On Aug. 18, 2010, SSG Wasson’s platoon was ambushed during a night patrol. SSG Wasson’s vehicle was hit by two rocket-propelled grenades (RPGs), resulting in the loss of his left leg. SSG Wasson spent the next two years undergoing surgeries and rehabilitation at Walter Reed Medical Center and Brooke Army Medical Center before medically retiring in 2013. Frank finds that his current living environment is not safe, accessible or comfortable. He has frequently tripped on the carpeted floors and has also slipped in the shower on his prosthetic. A new specially adapted custom Homes For Our Troops home with hardwood floors and a roll-in shower will eliminate these hazards. The financial freedom of receiving a donated home will provide stability for Frank, his wife Brooke, and their two sons and daughter. “This home will be a forever home for my family and me to enjoy, instead of worrying about when our next move will be,” he says. Once he receives the home, Frank is looking forward to dedicating more time coaching his sons’ baseball teams and going back to school. He recently coordinated and established multiple youth strength and conditioning camps for young athletes during their off-season. 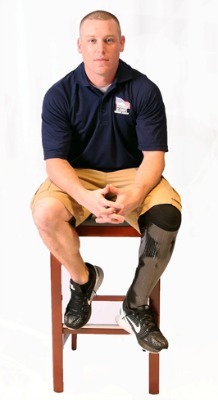 He also looks forward to having more time to play on his Wounded Warrior Amputee Softball Team. For the 2017 season, Frank developed, implemented and led the team’s Annual Amputee Kids Camp Training Plan of 15 teams members and 30 youth athletes in Washington, D.C. His other hobbies include hunting, fishing, and photography. He is also on the board of the historical Military Order of the Purple Heart Organization Chapter 305 of Salem, Oregon. Since being injured, Frank enjoys pushing the limits and has completed the grueling 26.2 mile Bataan Memorial Death March in White Sands, New Mexico, the 26 mile Grand Canyon Rim to Rim and has completed in multiple CrossFit competitions. Originally from Salem, Oregon, Frank is choosing to build his home there to be close to family. Frank says receiving the home is “a blessing beyond measure” and is grateful to HFOT’s donors and supporters who are making it possible. “I cannot thank you enough for giving my family and me the gift of a fresh start and making my life much easier. It will be a huge relief to me mentally and financially,” he says.